Gas Hydrate Chunks of gas hydrate recovered from the Gulf of Mexico in 2002. Photograph by Bill Winters, USGS. Gas hydrates occur on continental shelves worldwide. Pohlman and colleagues compared the composition and source of gas hydrates at six sites. Fire Ice Also known as "fire ice," gas hydrates contain methane and other flammable gasses. Photo by Deborah Kelley via GEOMAR. A study of gas hydrates by researchers at the Virginia Institute of Marine Science (VIMS) is among the top 25 most-downloaded articles in the journal Marine Chemistry according to Science Direct™, an on-line database of the latest trends and developments in science. Gas hydrates, ice-like mixtures of water, methane, and other gases found in seafloor sediments, are the substances that have hindered several attempts to capture the oil leaking from the Deepwater Horizon drilling rig in the Gulf of Mexico. The research article—authored by VIMS alumnus John Pohlman, VIMS professors Elizabeth Canuel and Jim Bauer, and colleagues from the Naval Research Laboratory, Scientific Applications International Corporation, and the University of Victoria—breaks ground in comparing the source and composition of gas hydrates from 6 different seafloor sites around the world, including Green Canyon in the northern Gulf of Mexico. Green Canyon—also home to several deep-sea drill rigs—lies about 75 miles west of the Deepwater Horizon oil platform that exploded on April 20, killing 11 workers and setting off what is now the nation's largest-ever oil spill and environmental catastrophe. Gas hydrates are common within deep-sea sediments of the outer continental shelf, where cold temperatures and high pressure keep them in a solid state. They are of major scientific interest due to ongoing concerns about the challenges they pose to deep-sea oil operations, their possible role in global warming, and their own potential as a source of hydrocarbon energy—geologists estimate gas hydrates may contain as much carbon as all other known fossil fuels on Earth. 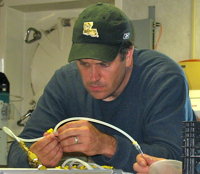 Pohlman—who received his Ph.D. from the School of Marine Science at VIMS in 2006 and is now a Research Geochemist with the U.S. Geological Survey in Woods Hole, Massachusetts—led the worldwide study of gas hydrates. The team's goal was to use naturally occurring carbon isotopes as tracers to determine the relative amounts of gas hydrate that form by microbial breakdown of recently deposited organic matter, or through burial and geothermal heating of much older, deeply buried organic matter. Their results show an overwhelming contribution from fossil sources—98 to 100% of the methane bound within the gas hydrates they sampled was fossil carbon derived from upward migration of methane from deep-seated petroleum pools and microbial degradation of deeply buried organic matter. Pohlman says an unexpected finding was that almost 30% of hydrate-associated methane at a cold seep located off Vancouver Island, Canada was formed by microbial degradation of shallow, recently buried organic matter, indicating that gas hydrates may form on timescales shorter than previously thought. The team's findings will help climate scientists better understand and track changes in the oceanic global carbon cycle, particularly in light of concerns that warming seas are causing release of methane from gas-hydrate deposits in shallow polar seas and nearby onshore areas. The resulting release of large amounts of methane gas into the ocean and atmosphere would act to accelerate global warming: methane is 28 times more potent as a greenhouse gas than carbon dioxide. The Top 25 Hottest Articles is a free, web-based service of Reed Elsevier PLC that tracks the number of journal articles downloaded from ScienceDirect, a full-text scientific database offering articles and chapters from more than 2,500 peer-reviewed journals and more than 11,000 books. The ScienceDirect database holds more than 9.5 million articles and chapters, and is adding almost 0.5 million per year. It includes digitized journal articles from as far back as 1823.